The aroma is a result of masterly distillation. After distillation, the final product is stored in traditional earthenware containers to develop ist full flavor. 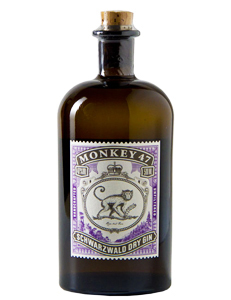 Monkey 47 Gin has a distinct and pure scent of juniper berries but as well a tangy and crisp grapefruit note. In the finish, you will taste a hint of peppery spices. Whether as a Gin Tonic, a martini, or a gimlet, the taste of Monkey 47 is the perfect basis for both classic and more extraordinary cocktails! You can easily buy a bottle of Monkey Gin online at the ALANDIA Gin Store. We ship worldwide. Check out as well our exclusive accessories like Gin & Tonic glasses or Copper Mugs for Moscow Mule. Where can I order Monkey Gin online? Monkey 47 is already distributed all around the world. But sometimes it is not so easy to have a bottle shipped. At ALANDIA you can purchase a bottle easily online. Paypal and all major credit cards are accepted and the shipping is made via DHL Airmail or Courier Express. You get your Gin in 3 days (EU), 8 days (USA), or 10 days (World). US customers can also use our Express service and the bottle is then delivered within 3 days. At ALANDIA you can also order other premium Gin. We recommend for example Six Ravens London Dry Gin. This Gin is distilled according to the London Dry Gin tradition. Meaning that no sugar is added to the final distillate. Six Ravens Gin uses fresh ginger roots as part of its recipe. This provides this premium Gin with a very unique aroma. It is a mixture of fruity- and spicyness, which fits perfectly to a slightly bitter Tonic Water. Six Ravens is the perfect Gin for a premium Gin & Tonic. A nice feature is as well, that every bottle is hand-corked and hand-waxed. Monkey Gin is just tasty, fullstop. If you have tried it, you know what I´m talking about...."
„In honestly think that Monkey 47 Dry Gin is one of the best gins on the market. Usually I prefer to drink Tanqueray No. 10 as I like a strong juniper aroma. Monkey 47, as it is distilled with 47 herbs, has a much more complex profile. Grapefruit is present with a slightly peppery note. Mixed with your favorite Tonic Water, I drink Fevertree, it has a very unique aroma. Overall this monkey is a perfect variation if you normally drink the more classic gins."